Trading a defensive minded team with an All Star goaltender in net for another defensive minded team with an All Star goaltender may just suit to the way the Washington Capitals have been playing of late. The New York Rangers pride themselves on keeping their opponents to limited chances on shots by blocking a ton of rubber in front of Henrik Lundqvist. Even Strength - The New York Rangers scored two less goals than the Capitals in the regular season. Ranking the pair right next to each other overall with the league. But through a playoff round, the Capitals have scored 12 goals five on five compared to the Rangers 9 goals. Both teams played in seven game series. The Rangers' offense has struggled in the playoffs so the team has had to lean heavily on their defensive efforts. They stifled the Ottawa Senators' explosive offense to just eight goals at even strength. The Capitals have done a 180 degree turn in the playoffs. Once a free wheeling, offensive power house, they have instead clamped down on their defensive system and have had success with it especially in close games. Goals at even strength should be tough to come by for both teams. This one is starting to look like it could sway in the Caps' favor. Power Play - In the regular season, both teams struggled at times with the extra man advantage. But the Capitals found more success with it than the Rangers at season's end. The Caps 16.7% power play efficiency would be good enough for 18th in the league. The Rangers, at 15.7%, did fair much better, settling for 23rd in the league. In the playoffs, both teams are pretty much at a draw with the power play. The Capitals fair a shade better than their opponents with their power play goal percentage at 15.8%, the Rangers at 15.6%. Call this a draw. Penatly Kill - It was a bright spot for the Capitals in their series against the Boston Bruins. The Caps did such a good job on the PK, that it took until game six for the Bruins to score a power play goal. Boston went 2 for 23 for the series, giving the Caps a 91.3% second only to Phoenix Coyotes for best in the playoffs. The Rangers finished middle of the pack with their penalty kill (84.6%) and allowed four power play goals against. Slight edge to the Capitals. 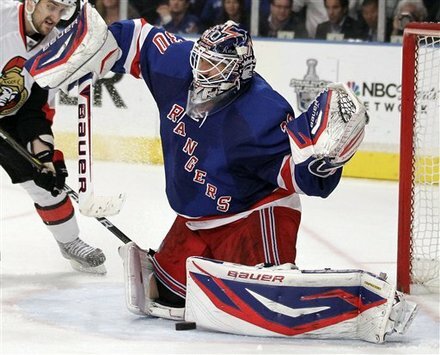 Goaltending - Henrik Lundqvist could win the Vezina and Hart trophies for his efforts in the regular season. He is clearly the leader of this Ranger squad. He only allowed 12 goals in the previous series against Ottawa. His numbers are solid with a .940 save percentage and a 1.70 goal against average. Lundqvist also seems to play his best when the most is on the line. But the Rangers can't totally rely on their talented goaltender with out some offensive output. Braden Holtby in contrast only played as many regular season games as he has playoff games, 7. But his numbers in the post season are nothing to snark at. A .940 save percentage and a 2.00 goals against was good enough to knock off the defending Stanley Cup Champs. 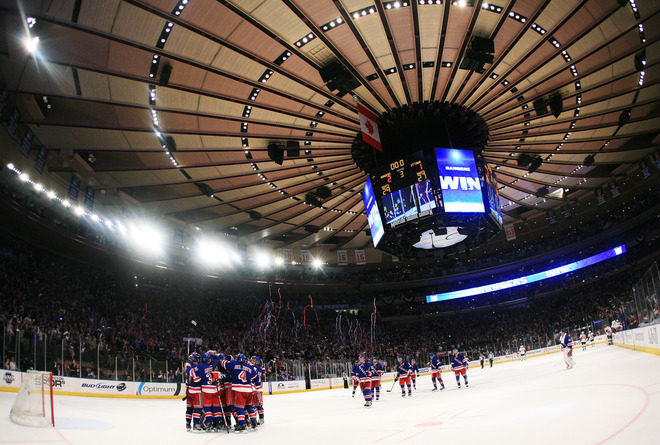 Give the slight edge to the Rangers. Final Thoughts - The Capitals on the road in the regular season was dismal. In the playoffs it has been sparkling. Defeating the reigning Stanley Cup Champions in game seven in their building has given this team the confidence boost they needed. But they will need to keep up the good play on the road as they will start against the best in the Eastern Conference at Madison Square Garden. The Rangers have been good this season at home and this will be a challenge for the Capitals. In the regular season, the teams split their four games they have played. But it was the last game of the season that might be in the back of the heads of both teams. The Caps, previewing their patient defensive system easily handled the Rangers for the 4-1 win. The Rangers might have been looking past the Caps, but it was a win they wanted to try and win the President's Trophy. The Rangers will have to find ways to score and put a little doubt into rookie goaltender Braden Holtby to win. If they can get their offense sparked, it could cause problems for the Capitals if they are constantly trying to come from behind having their own offensive struggles. For the Caps to win they have to get on the scoreboard early and frustrate the Ranger forwards.